Do you offer warranty on your HID kits? We offer the best warranty on HID kits over any other competitor. We carry a one year replacement warranty. This warranty covers your ballasts and bulbs. If for example a part fails on your kit within 365 days of the purchase date, we will gladly send you a replacement part. Other companies will waste your time by having you send the broken parts before getting replacement. This means huge downtime. Some companies may not even honor their warranty. Customer is responsible for shipping & handling charges. We are the expert in HID development and design with over 10 year’s experience. Our kits are manufactured under strict quality standards in our ISO-9001 certified factories. The ballast and the burner in this kit have passed the most stringent OEM specific tests. 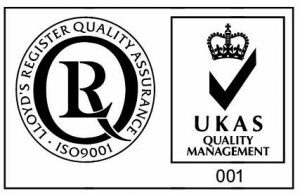 Further, we have HID certified technicians available to answer any of your technical questions. Not only are we the manufacture, but we are also the consumer of our own products. What are the advantages of having a Xenon High Intensity Discharge (HID) lighting system? An HID/Xenon bulb produces roughly 3 times more lumens than a halogen bulb. HID bulbs consume 30% less power than halogen bulbs. With no filamentto vibrate and fatigue, HID bulbs last roughly 10 times longer than halogen bulbs. 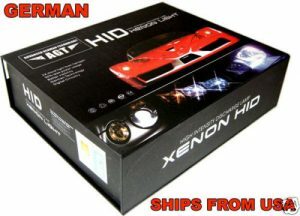 What is the difference between an HID kit and “Xenon Claimed” Blue Bulbs sold on the market? High-Intensity Discharge (HID) lights have a tube of glass that replaces the filament of traditional halogen light bulbs. The gas is ignited with 20,000 volts and stays illuminated by a constant 12v source that is provided by a ballast which is connected directly to your battery. Cheap xenon-filled halogen bulbs do not use the same technology and are tinted blue to give off a white light. They still have a filament and produce less light output then standard halogen bulbs of the same wattage. Can I install the kit myself? For anyone who has installed a light bulb in a vehicle, this installation is considered do-it-yourself. Most vehicles the headlight bulbs are easily accessible, others you have to take the whole front bumper off. We recommend you check with your owner’s manual on how to install light bulbs. Why should I never touch the glass of the HID bulb? Never touch the bulb glass with your hands or allow it to get in contact with oil, grease or other liquids. This will shorten the life of the bulb by creating a hot-spot. If you do touch the glass, please use rubbing alcohol to clean the glass surface before final installation. Can I switch back to my stock bulbs after installing this kit? Yes! It is 100% reversible and can usually be reversed in 20 minutes, depending on how difficult the bulbs are accessible. I’m confused about the 6000K, 8000K, 10000K numbers? These numbers simply reflect the color output of the bulbs. They have nothing to do with brightness. 6000K will give out a pure white light while 10000K will give you a more blue tinted light output. 30000K we offer will give you a purple tinted output. Do I loose my high beams if my vehicle uses 9004, 9007, H4/9003 or H13/9008 type bulbs? No, all our kits include a high beam for bulb sizes 9004 9007 H4/9003 and H13/9008. The high beam is a halogen bulb on our regular and slim digital kit. If you are looking for an HID kit that does both low beam and high beam in HID, then you need to consider our Bi-xenon kit or Philips kit. Why choose our Digital Slim kit over our standard ballast kit? The Digital (electronic) Ballast is the latest in HID Ballast innovation. The Digital Ballasts are more efficient, quieter, cooler and softer/easier on the HID bulb all the while allowing for a much smaller and neater package. The Digital Ballasts do not have any of the usual transformers or capacitors; instead these ballasts have electronic circuitry doing the same job, only much more efficiently using significantly less current. The Digital Ballast have the capability of self diagnostic and reset, including specific protection circuits to detect various lamp-and ballast-fault conditions allowing to safely shutdown or reset the ballast. When the ballast fires the HID bulb it sends full power to the cold HID bulb. Over time, this shortens the HID bulb life and reduces the output and life span of the increases the power over the next few seconds until the HID bulb has reached full brightness. 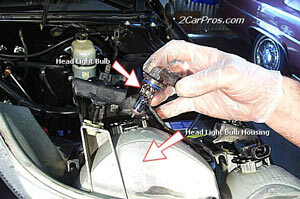 This is also known as soft starting, which minimizes the damage to the HID bulb and increases its life. After one year of use the usable light coming from HID bulb being used in the coil type ballast would have lost over 10% more usable light over the same period of time. Can I just buy the HID bulbs and install on my vehicle? You can only do this if your vehicle came with xenon from factory. If your vehicle has halogen standard bulbs, you need the kit otherwise you won’t be able to power the HID bulbs. They operate at 23000V vs 12V found on all halogen.